Between January and April 1877 Monet painted a series of 12 views of the Gare Saint-Lazare in Paris, both inside and immediately outside the station. These focus on the building itself and the trains, subjects that until then had received little attention in art. The Gare Saint-Lazare had been substantially reconstructed in the early 1860s and the structure shown here was one of the results of this work. Its huge expanse spans the composition, the central peak of the roof being exactly at the middle of the canvas, while to the right can be seen the slender iron column that supports it. The seemingly lightweight, airy quality of the building is enhanced by the large skylights at the top. The architectural features provide a geometrical armature for the work, which also includes the network of girders on the left and the parallel lines of the roof braces overhead. Further, the sun shining through the skylights throws a rectilinear pattern of light and shadow onto the track area of the foreground. Despite the impressive scale of the building, the billowing blue smoke from the engine and the other clouds of steam soften its contours and fill the space. The engine itself is cloaked in steam and smoke, making it less a symbol of speed and power than an almost immaterial form. In the foreground is a rail worker, and along the right are people waiting for trains. The strong sunlight picks out buildings in the background, while bathing the image in a golden glow. At least seven of Monet's works from this series were shown at the Third Impressionist Exhibition of 1877, and these formed the centrepiece of his contribution. In his review in L'Impressioniste Riviere suggested that the works conjured up the "noise, screeches and whistles"" of the station and the "shouts of the workers", though he nevertheless felt forced to admit the "monotony and aridity of the subject", an indication that he too found it difficult to accept technology as a subject for art. 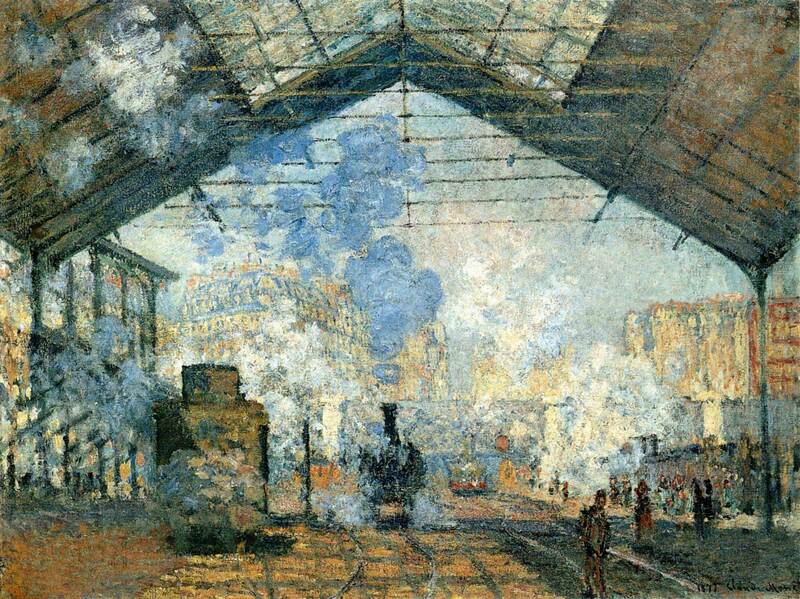 Even more uncompromising is Monet's picture from the same series showing one of the signals of the Gare Saint-Lazare.